Technology has the potential to disrupt and to enable. WHAT IF a large number of professional skills are rendered obsolete by what are, in effect "apps"? Those apps are evoked by equipment that has descended from the cell phone, but which is now situationally aware: it knows about its owner, their personal situation. needs and dependents. can assess the current situation in which they find themselves and offer pertinent advice. Consider a political speech that is subject to critique on content and style in real terms. Consider feedback on one's social performance at a party: he or she is interested in this, here is an interesting ice breaker; "you got that wrong because..."
WHAT IF this occurs on a global scale? Oh Yes! The next generation will have augmented reality - things you want to know pasted over what you see - and what's called near field communication, which has your apps and those of for example a shop chatting to see if there is anything that matches your past behaviour or interests. PARC already have Magitti, which more or less does this. If it handshakes with your store, which has you as a point in a space populated by petabytes of purchase data, it gets that much more. It can check the viability of financial transactions, including buyer reputation on things like EBay. Various firms are working on real time speech recognition, with a view to translations and a spoken interface. This seems a bit tame - if the software can search past texts and e-mails for your interests, it can do the same for speech. After a few months, it knows you better than you do yourself. (Of course "it" isn't the phone any more, it's a bunch of applications on the Cloud, and some stonking databases. A lot of work is going into secure self-configuring networks, chiefly for military uses - the platoon splits from the HQ net automatically, for some grades of comms - but this can apply just as well to the family, the (commercial) company, any interest group. Indicators would be aware of all comms on each layer, of individual locations and so forth, and give the user flags as to who is congregating, busy, doing things that it can recognise like gather for an after-work drink. Microsoft's BayesPhone loads rules onto cellphone, allowing it to decide whether to put a call through or send it to voicemail, based on the user's calendar, business, familiarity with the number. If that could interrogate the sender's telephone, it could do even more subtle things. BT's SWORD (Small World Directory) holds databases of company telephone books,and uses AI to find the person that you need. Artificial Life Inc have launched the Virtual Girlfriend application, which uses an interactive 3D role-playing engine to simulate a 'real-life' relationship. How, Lord knows; but the "empathy engine" can be harnessed to sooth customers and deal with people in a life like way, they say. My point is that all this is in development /demo right now. In ten-fifteen years we will certainly have what you discuss. It won't be "on" a cellphone, as these will be interfaces to a cloud that is omnipresent in a way that cellphone signals are not, and much faster than present comms. You personal interface - which may look like spectacles or anything else, who knows right now, will just be the interface. What it interfaces to is up to you, and there are indeed issues of privacy and anonymity to consider. The cloud will have to be spectacularly secure, as ripping this set-up would allow for huge, vast, wide fraud. Imagine if I can simultaneously convince a billion cell phones that I am their best friend, and to give me $10! But the implications are also vast. If you have a gadget that you can have conversations with, which is your research assistant, imagine how much smarter you will be, how much more fun you will have. If everyone is like that, imagine how much the smarter people will get disproportionately smarter. Company networks will convey "special powers" on individuals. State networks... may see too much. You had a scenario called Waking Up. Here you go. If professions become semi-automated, this really does not matter. People just go up the skill ladder. If you give me a smart assistant, I just stop doing that bit of my work load and concentrate on the other parts. An architect had to spend a lot of time of drawings. Now they do that on a CAD system and it even specifies the materials to order. That doesn't make them obsolete, but it does change the job for the better. It is indeed scary to consider the future where many jobs will eventually be taken over by algorithms. We have seen how automated caller services had replaced phone operators, and Siri is taking over the role of personal assistants. Algorithms are even able to approximately interpret emotions, which can be further improved with machine learning. In such a world, the jobs that remain for humans may be those requiring judgement within complex set-ups. But there is still a big 'if' - whether humans are fundamentally comfortable to let parts of their lives be taken over by apps or algorithms. The ideal of the 1990s was to roboticise the workforce. Tasks were defined, and people or systems were deployed to undertake them. This made IT easy to apply. However, it has become very clear that whilst this may be an efficient model of how to manage an unchanging system, it stands in the way of adaptive change, innovation and the efficient use of what people know. The major issue is, however: how to get the right people talking at the right time? Many companies are starting to implement social networks to promote collaboration, generating what is known as enterprise social networks, or ESN. In 2010, 92% of Fortune 500 companies were using at least one social media channel, up a fifth on the previous year. Professional groups are also developing such systems - for example, Medpedia is one of about 70 medical wikis that allows physicians and researchers to share information. ESN products, whether installed on-premise or delivered via the cloud, typically offer microblogging, employee profiles, activity streams, document sharing and joint editing, discussion forums, brainstorming tools and the ability to rate, review and tag content. This industry is becoming a major business. Spending on ESN products grew almost 40 percent last year to $767.4 million, and is expected to grow at a 42 percent compound rate through 2016, when it will reach almost $4.5 billion. Microsoft has recently bought Yammer for $1.2bn., intending to integrate it into the Office suite. Yammer has five million users, an astounding rate of growth in its four years of existence. It is used by 200,000 businesses in more than 150 countries, and by more than 85 percent of the Fortune 500 companies - for example, by Ford and Deloitte, which has 190,000 employees connected through a Yammer intranet. Yammer competitors include Jive Software, NewsGator, Socialtext and Tibbr. In addition, larger software vendors have also been adding ESN features to their broader collaboration suites and enterprise applications, including IBM, Oracle, Salesforce.com and Cisco. All of these products have to work seamlessly with products from other vendors, such as Salesforce.com and SAP. The key to getting these systems to work usefully - and not to generate chatter, or be drowned by loud voices - is training, active supervision and discussion moderation. There is every hope that much of the supervisory role and moderation and précis can be handled automatically in the next five years. Add to this the next generation of business process re-engineering - that is, the automatic identification and assignment of sub-tasks, given greater objectives - and you have a structure that can convene groups to define the problem to be solved, solve elements of it and compile the whole into a project plan dynamically and with high level human supervision. That is well down the road to your Waking Up world. I want to make the point that this is about social networking, which is a whole lot more than Internet 2.0. What I mean is that a sucessful organisation has a particular social mix, values, set of customs that create the conditions for - for example - innovation. Many put this down to leadership, which is kind of a tautology in my opinion. Good horizontal and vertical communications matter, an leaders can make that happen to some extent, but they can stop it really easy. What only leaders can do is set the general goals in way that both make sense and are open to action lower down. That means, not generalities, but highly specific analysis leading to clear actions that need to occur. The "how" of this then seeds up the tree, and meets a ready set of ears. Here's a book that demolishes the idea of the star performer. After examining the careers of more than a thousand star analysts at Wall Street investment banks, and conducting more than two hundred frank interviews, Groysberg comes to a striking conclusion: star analysts who change firms suffer an immediate and lasting decline in performance. Their earlier excellence appears to have depended heavily on their former firms' general and proprietary resources, organizational cultures, networks, and colleagues. There are a few exceptions, such as stars who move with their teams and stars who switch to better firms. Female stars also perform better after changing jobs than their male counterparts do. But most stars who switch firms turn out to be meteors, quickly losing luster in their new settings. Zachary Neal found that although America's largest cities once had the most sophisticated economies, today that honor goes to cities with many connections to other places, regardless of their size. The study identifies Denver, Phoenix and even Bentonville, Ark. -- Wal-Mart's corporate home -- as some of the most well-connected and economically sophisticated communities. Neal examined the population and air-traffic data for 64 U.S. cities from 1900 to 2005. He found that a city's population was the most important factor for its economy until the 1950s. After that, the key variable was the density of cross-country business networks. That trend has strengthened. Successful large cities - including New York, Los Angeles and Chicago - have developed around networks. They have retained their economic clout. Others - like Detroit, Cleveland and Pittsburgh - have remained both "poorly connected" and slow growing. This holds true for the overall economies of the cities and for specific sectors such as manufacturing. Smaller cities that were essentially insignificant 50 years ago but have emerged as major economic centers, with the network development leading rather than lagging growth. Such towns include the Raleigh/Durham area of North Carolina -- which pooled its regional resources to focus on innovation and creativity -- and Miami, which took advantage of its location to serve as the primary link between North, Central and South America. Neal believes that the transition from a size-based hierarchy to one rooted in networks wil continue, given the growing strength of the relationship. Most people will soon live in cities. Global urbanisation will hit 50% in 2013, acording to the UN. Despite our intuition that our footprint is higher in cities, it is in fact lower. Urbanisation is good for the environment. It is good for innovation and commercial enterprise, as Comments 5 and mostly 6 have shown. 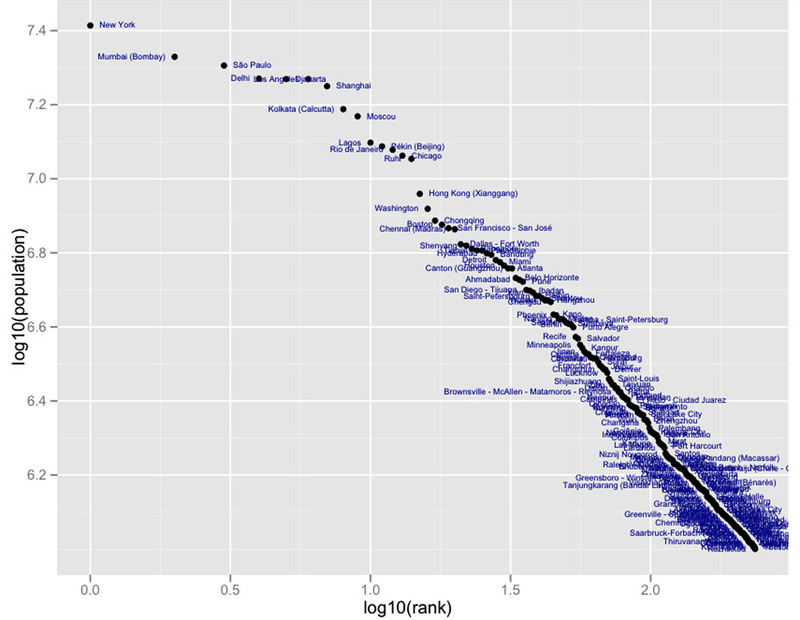 The figure shows the so-called Zipf law for cities, which I find fascinating. ("Rank" means what it says - the biggest, the second biggest.) The implication is that there is a fixed hierarchy in respct of size, and size changes pretty slowly. However, this breaks down completely when you try it for economic scale. There is no fixed hierarchy, and indeed cities can scoot about with extraordinary speed and flexibility. If it is due to networks, then fine; but I agree with Comment 5 that this is about how people get on together, human capital and the absence of muddle, no small part of it official muddle. Look, I'm not a "government is bad" person at all - I have worked in government all my life! - but there is a balance. No government makes for a bad environment, bad government makes for a worse one, too much government is a tautology, of course, but there is still a truth in there. I mean that a too orderly society can also be a paralysed society. I think that you are missing a trick. That trick is biology. It is not possible to make re-make cells into stem cells, and culture organs from them. At present it is only simple organs, such as sweat glands, but retinal sheets are in development and major organisms will follow. The point? That you can look to an infinite supply fo spare parts, all identical to your existing body and therefore unlikely to trigger immune reactions, or transmit unpleasant diseases. Around one person in three over the age of seventy has degenerative maculitis, which destroys their vision and makes them dependent on others. Very much "and so forth". Biology is phenomenally complex, and we are getting tools that let us see that complexity. Devices now routinely monitor the activation and repression of up to 18,000 genes in a sample. Gene sequencing is now simply, swift and cheap: a human sample can be sequenced in hours at a cost of a few thousand dollars, whilst the first sequence took $3 billion and four years. There are now a million human gene sequences on database, and these are being searched for disease markers. Promising new therapies for e.g. diabetes are emerging from this immense array of data. Systematic markers for several variants on lung and other cancer, psoriasis and a raneg of other diseases now exist, potentially guiding therapy. But the real advances are not happening at the level of technology, but of fundamental science. One tool that allows us to probe this complexity is simulation, Computer-aided design has revolutionized fields from aeronautics to civil engineering. CAD is now finding a place in bioengineering. The release of a simulation of the complete life cycle of the pathogen, Mycoplasma genitalium allows researchers to pose "what if" questions. The simulation addresses all 525 genes in this simple organism. (Humans have around 22,000 genes, the common bacteria E. coli has 4,288.) It runs on a cluster of 128 computers and models the complete life span of the cell at the molecular level, charting the interactions of 28 categories of molecules — including DNA, RNA, proteins and small molecules known as metabolites, which are generated by cell processes. The researchers used data that was taken from more than 900 scientific papers to validate the accuracy of the model. A model for yeast is in the planning, as is one for E. coli. Let me change track. There is an explosion of new techniques in neuro-anatomy, ranging from gross anatomy to the functioning of individual modules of cognition. Genetic manipulation makes individual neurons take on different colours, the so-called brain bow. Long extensions, the trunking of the brain, have been mapped with exquisite nucleo-magnetic resonance experiments. The project to describe the anatomy of the mouse brain will have mapped every single neuron by the end of the year, and the connections between those neurons is in prospect for 2013. Genetic modification allows researchers harmlessly to turn on and off individual neurons, using a laser. Precise measurements of the visual cortex using functional magnetic resonance imagery (fMR) allow the reconstruction of what the person - for this works on humans - was perceiving, or imagining. The process of though can be tracked, and given our understanding of what the individual modules are doing, it is possible to obtain accurate high level assessments of how a person is reacting - emotionality, concentration and so forth - during a task. (Here is a popular-level report, complete with images.) The commercial race is on to achieve this by high resolution encephalography, using simple external electrodes. Clearly, such capabilities point to completely new and intuitive computer interfaces, for daily use as much as for military and other applications. Biology is exploding in slow motion because it is so complex, because it has a number of ethical and regulatory hurdles to jump and because there is no single base on which it advances. We note medical advances, but fail to see computational biology as having a common thread. We ignore agro-biotechnology, although this will be a - indeed, already is - multi-billion industry. Few realise that China alone now has 2.6 million hectares of genetically modified cotton in production, and that it uses little or no insecticide on that crop as a result. It has 33 million hectares of GM maize and soybean, and is experimenting with new rice varieties that are drought tolerant, which have better protein content and which are also insect resistant. Sorry to be slow to get back to you one this - we have been in Japan on a conference about networks, how you understand them an get them to change. I'm going to summarise what i heard. First, though, I need to clarify what is meant by "network". This is not just set of connections, or rather, it includes a set of connections, but what matters is what these connections actually do. Not chatter but actions. Pretty much everyone lives in networks, and what we know now about organisations is that pretty much everyone in them does what their peers expect of them, You think just Asia? No: evidence is that all of us do this, whether health in the US or media reporting in the UK. We look at what we think others expect of us, and we do that - maybe to compete with others in network, but compete in the "right way". You may grab sales from another salesman, but you do not kidnap his children or tell other workers he is not safe alone in elevator. Or only if you are psycho, and then not stay long in network. So the picture shows what happens if you ask everyone to say who most influences them. What this shows is how influence and change flow, or how it is resisted, how the ideas move around and so on. Most of all, it shows how the current situation has problems and maybe gets fixed. You can do same thing using e-mail traffic and by looking at the Intranet. That shows traffic volume, and who initiates flow. Trouble with that is, people who put out routine stuff come out as top influencer, which is not right of course, so your system has to look at the text; like is it formal or is it colloquial language, which machines can now do easy. Military very interested because orders go out like star from centre to the people who take orders, but you also need to separate out guys who put out army newspaper, which does the same. But newspapers never go out in steps, they go to all at once; and the language is different, you you can shoot rockets at command centre but not at newspaper publisher. You can prune the network to weaken spread. This works with disease and with terrorism, also with political activism and so on. You can break the network up into chunks, so that you can influence each one in its own terms. This is very powerful when the groups in an organisation are really different cultures. First, you can increase the density of the network, so that more people are talking. This is only useful if you do it sensibly, getting the right people to talk. What means "right person" depends on what you are doing, but is easy to define from properties of individuals. It is important to separate "influence" networks from "social" networks. Influence spreads out from one person or one authority, like board or commanders' group. Social networks are less structured, more interactive, more personal, usually more local. Both need trust to work - trust that this or that 'authority' is worth risking my career to follow - having trust that they know what is happening - or having trust that this group of people that i know something about personally will not betray me or take me off course. Again, reputation and track record is everything, and access to this can be automated. You see it in like Reddit, Facebook or LinkedIn, where people get kurma points or followers. 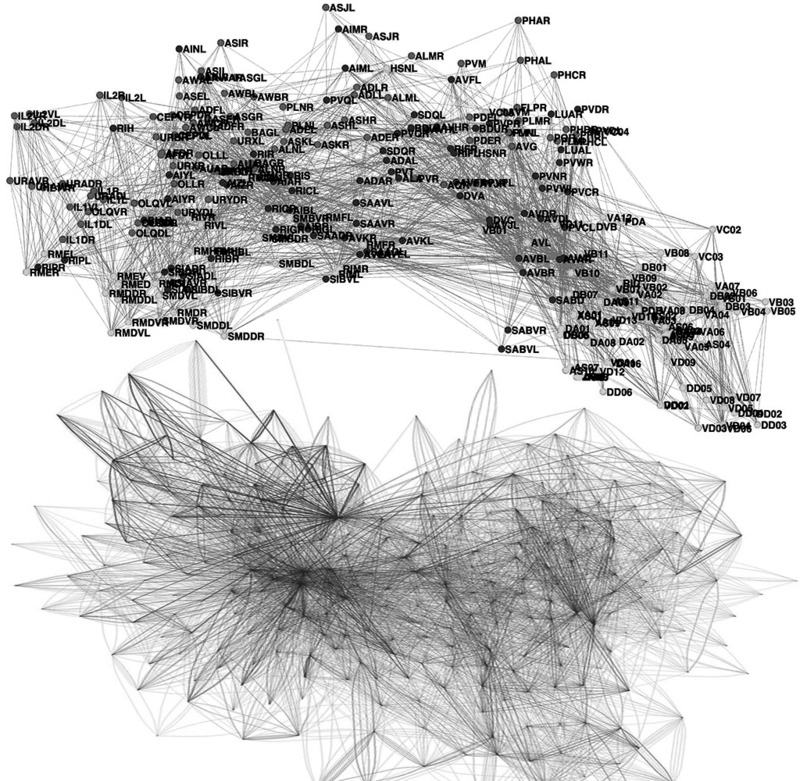 Second, you can find influencers through network analysis, and then work on them alone. There are influencers who block change, often senior people because their power comes from the current situation, not from change. So you have to build up the positive people and build channels around the negative ones. Again, ask around about who is number one person to help or hinder change and you get a figure like the one above. Third, you can break the network into groups, and talk to each in their own terms. Some cadres - like engineers - have their own way of thinking, their own kind of language. They like an idea built up logically, for example, whereas marketers like a picture, and you explain how to make the picture real. Also, the deep values are often different in different groups. Compliance, regulatory affairs and quality control people do not respond well to the word "new". Sales people love competition, production people do not. In government front line people are more interested in "how", staff workers in "why". The real thing to balance is that each groups has its own way of being excellent, of knowing what makes a hero. The influence on the network has to work with this, not against it. This is not "just theory". If is easy to calculate an index of potential effectiveness for any one person. This is a composite of their strength and the potential for action of those who are connected to them. For example, and enthusiast surrounded by negative people will have a low potential. So, you can fix them up with better connections, or you can target people who have a better index. "Connecting them better" is what a lot of help programs do - say, Alcoholics Anonymous, Slimming networks or what the buddy system does in the army. You don't need a gym to get fit, but it helps because you meet all the others thinking the same way. Low threshold, fast adopters of new things and ideas can be recognised by their language in e-mails, by the things that they use to communicate, such as telephone models or tablet computers or whatever comes next, and by what their peers say about them. If you target these people, you build up momentum until the system flips and all come to adopt their perspective and behaviour. Factors such as myth making and hero construction emphasise this: lunch with the boss, awards, articles in internal papers and so on. People catch on real quick when there is a success model that applies to several people around them. Just the same works with groups like the yellow group in the figure: if they all "go over" to the new style, and this is approved by authority, the connecting groups will probably follow. The "snowball model" and "viral marketing" are pretty much the same. They encourage fast adopters to recruit new people to the new style. There is simple mathematics to show when this will tip into new behaviour for all: the same equations as medical epidemic or brush fire. Leaders can be people who show by example or people who explain. They are usually not the same people. Either of them can be identified by surveys - for example, in the first figure - and by indirect studies that look at the operations space, meaning what people close to them actually bring about, or what social or operational track records this subnetwork establishes. (Operations space usually is constructed from the relative amount of information that is interchanged on both directions, but also from performance over time. A high performance team is a lot more useful than a high performance individual. You find that these groups tend to stick together, like in army units and also companies and in government. Sometimes they even switch companies together, particularly in US and EU financial services, Japanese sales and the Asian medical professions.) Lots of work - say, in medical practitioner networks or in drug control programs in schools - that uses formal network analysis shows that connecting effective leaders into existing networks delivers much faster results, and hastens the tipping of the group to a new values set. One crucial issue for intervention to work is to balance advice and peer networks. Remote advice networks - formal leadership, experts - do not seem to work well on their own, as they are consulted piecemeal, are generally very vague and general and do not have trust or two-way interaction built into them. A doctor may look up a difficult case on the Internet or in a text book, but he or she will probably want to discuss it face to face with peers before they take a decision. Generally, neither system works well on its own. Local peer networks can get swamped by the one false authorative voice, by group-think or it may simply not know the answer. But remote authority is not enough either. Geography gets mixed into this. If you want to spread a clearly useful idea, you can get away with remote networks, If the issue is controversial or new, you have to work through peer groups a well, because these ideas are "interdependent" in the sense that their strength is not in what they say, but in how many people say them. When a critical mass agree, the system tips and then everyone agrees very quickly. Controversial measures, obviously, take more work, but it is not work that is delivered by proof or lectures, but work that changes how people talk about the topic. Research on electronic networks show that they are already really good at providing the remote, advice-type network, perhaps where peers pool experience as well as being authoritative like a Wiki. IT can also be almost as good as direct social interaction amongst well-established peer groups. To be effective, these have got to have occasional actual physical interaction going on as as well. Where IT is no good is in the middle of this range. That is, people do not bother with views that they disagree with - there is no politeness on the net. They listen to sources that they already trust, and have discussions in groups that agree with what they already think. It is like newspapers - we do not usually buy ones that views that annoy us. People using middle ground networks seldom look for really new challenging things, and are really good at blocking "dissonance", things that they do not want to hear or which challenge their way of thinking now. Like advertising, these get brushed aside. OK I have gone for too long. But I want you to take two things back. First, understanding and managing change in networks is well-advanced. We can automate a lot of it, and people in the military are long way down this route already. Second, there are tools that can be used only when you understand how, and when you understand what problem you are trying to fix. But that understanding is not magical, and it will be increasingly automated as time goes by. So what I am saying is that by 2025 we will probably have what you describe. Perhaps more of a gee whizz than a directly relevant, but Willner et al have reported something extraordinary in AAAS Science, reviewed in no-technical language as 337 pp655-656 (2012). You will know that most evenmoderately high speed comms goes through fibre optics as a laser beam. Fourth generation fibres can handle over 15 Tbps (milllion million bits per second) which sounds a lot but is about the amount that oen detector at CERN generates. The new technique vastly increases this bandwidth. It is possible to give a beam a property called orbital angular momentum (OAM), which means roughly speaking that it propagates as a spiral. Quoting from the paper: ",i>A fascinating aspect of OAM is that an infinite, discrete series of values for the [...] twisting can be created, such that each OAM beam with one value is theoretically [...] distinguishable from all other OAM beams with different values.". In other words, you can stuff vast quantities of data down the same pipe. They were able to achieve 32 times increase in capacity using a simple experimental setup. They show that the current scheme - which uses different colours to transmit information in parallel - compatible with this scheme, allowing the two to be combined efficiently. The Internet just got bigger. Caenorhabditis elegans is a tine nematode that has been under scientific investigation since the 1970s. Its genome was sequenced in 1998, the first multicellular organism to be mapped. Its attraction is its simplicity: it consists of 959 cells in the adult hermaphrodite and exactly 1031 in the adult male. The species does not admit of females. Its nervous system consists of 302 neurons, which have also been completely mapped. This mapping has allowed the tracing of the control circuits that allow the nematode to mate: its programming, if you like, That is shown in the figure immediately below. My object in posting this is not to try to explain the image. It is to raise awareness of how fast all of this is now going. Biology has become a big science, in the sense of using huge teams and sophisticated machinery that is able to take huge numbers of measurements in a short time. Indeed, the human "exome" has just been published, the results of an immense study. C. elegans has around 22,000 protein coding genes and about 16,000 RNA coding genes that one way or another turn the protein coding on and off: its program. Humans have about the same number of protein coding genes, but these are about 1.5% of the entire DNA sequence. It turns out from the recently-released results from the vast ENCODE project that about 80% of this remaining DNA is dedicated to switching, the so called regulome. The regulome is transcribed into RNA, which then acts alone or in complexes with other RNA, proteins and other chemicals to block or promote protein coding genes, methylate them or the 'histone' blobs around which they are wound, so as to alter their long term properties and. in general. to act as the score and conductor to the cellular orchestra. 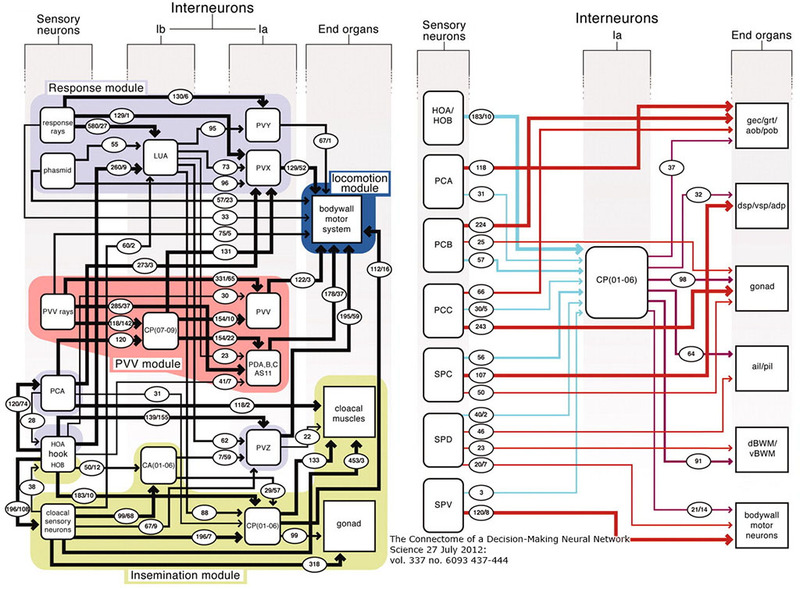 The mind numbing complexity of this can only be addressed by computer, and patters similar to but vastly more complex than the above diagram are coming into being. These are helped by arrays of specific RNA chains attached to micro sensors, that can monitor the switching of genes in real time across anything up to 16,000 genes. The picture that is shown above shows the switching relationships between a small percentage of the important genes in tinyy C. elegans. Below is a second visualisation, showing rather more genes but without their labels. This would have been unthinkable a decade ago. It will seem primitive a decade ahead. If we ignore progress in biology, we will miss a major factor that will shape 2025.